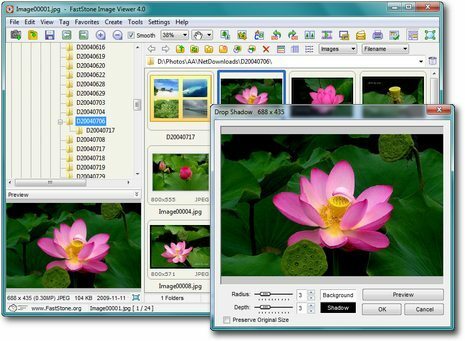 Description: It is an image browser, viewer, editor and converter that supports resizing, renaming, cropping, color adjustments, watermarks, EXIF support, lossless JPEG transitions, drop shadow effects, image frames, scanner support, histogram and more. It also includes a built-in slideshow with 60+ transitional effects. It supports all major graphic formats including BMP, JPEG, JPEG 2000, GIF, PNG, PCX, TIFF, WMF, ICO and TGA. You can also read this Guide for more info.